In the field, birders face many identification challenges. First, birds move quickly in and out of cover. More often than not, an observer has but a few seconds to see key identifying marks, often under less than ideal viewing conditions such as poor light, great distances, the innate shyness of birds, etc. Second, a typical daylong outing might result in over 100 different species sightings, many (if not most) of which cannot be positively confirmed (if ever) until long after the sighting. Bird observers in the field often carry at least one heavy 400+ page hard copy field guide, as well as notebooks, sketchbooks, writing and drawing implements, food, water, phones, and an array of optical equipment including cameras, scopes, binoculars and tripods. At the risk of stating the obvious, these are heavy and cumbersome. 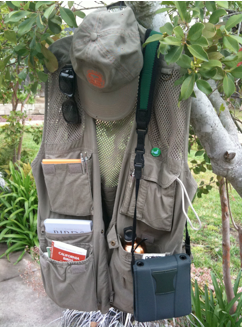 The fatigue associated with carrying this much paraphernalia is extreme, and can affect both observation accuracy and enjoyment. Species identification processes involve incomplete, imprecise, hand drawn or hand written notations jotted in field notebooks, or poorly captured photographic images that are then compared with field guides. With more than 900 different bird species in North America and over 10,000 worldwide, this is a daunting task for the average birding enthusiast that all too often results in frustration, and a lack of confirmed identification. Yet, there was no single “customizable” application available to the birder whose principal goals are to ID birds quickly, to improve their birding skills over time, and to fill their life list with as many different “confirmed” bird species sightings as possible.